Discussion in 'General' started by cliff leppke, Jan 29, 2019. The original mid-1990s RAV4 was small and funky. It was a two-door trucklet (the four-door arrived later) with a vintage Land Cruiser-style spare tire on its swing-out rear door. Things change. 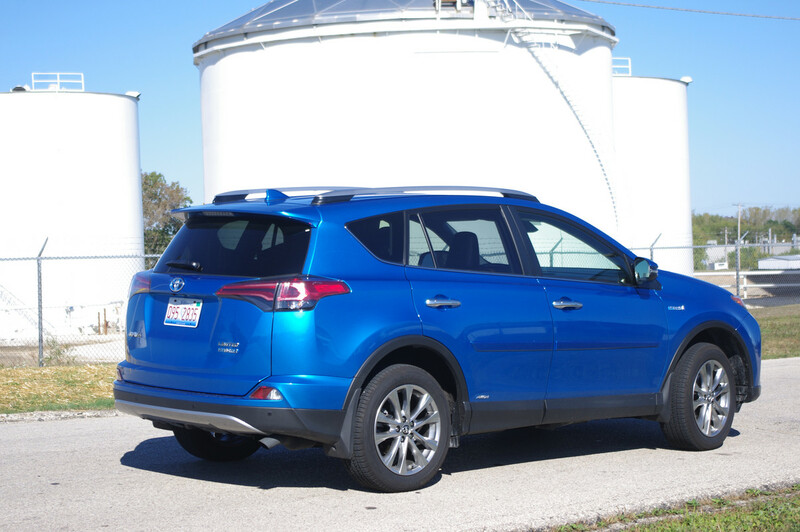 Now, it’s a family-sized compact crossover with a suburban-shopper friendly liftgate sans tire. It’s popular, too. Expect the next-generation RAV4 soon. Toyota, nonetheless, happily sells the current one. This review investigates the Hybrid Limited. Its stats are for wonks but worth examining. 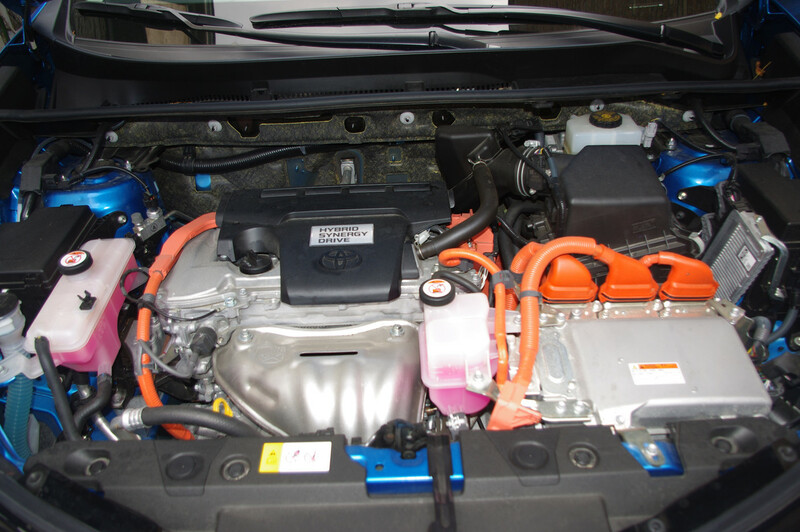 Toyota weds a 2.5-liter gas engine to two electric traction motors and one starter motor/generator. In front, there’s a 105-kW unit. In back, there’s a 50-kW unit. The caboose motor drives the back wheels, the gas engine and its electric motor motivates the front. Front torque is 199 ft lbs. ; rear is 103 ft lbs. Total horsepower is 194. A 34-module 6.5-Ah, 244.8-V nickel-metal hydride battery powers the motors. Hybrid trailer towing is 1,750 lbs. with the Limited, which includes sway control. One expects hybrids to increase fuel economy and reduce tailpipe emissions. I observed a commendable 31.8 mpg overall. The EPA’s numbers are 34 city, 30 highway and 32 mpg combined. A power gauge, which replaces a tachometer, helps you motor efficiently. Its needle indicates whether you’re naughty or nice. 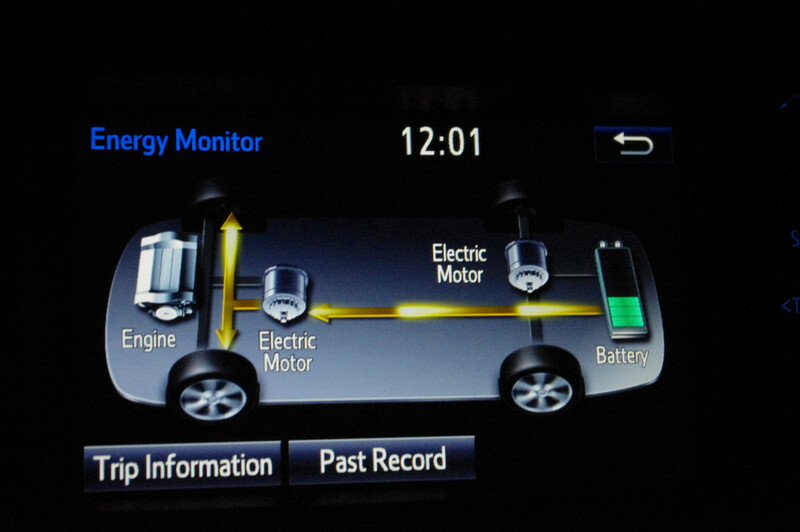 When the EV vehicle icon illuminates, you’re the MPV of mpg, propelled solely by electricity. Nonetheless, a conventional front-drive station wagon gets better highway mileage. One reason is weight. Going hybrid adds 500 lbs. to the RAV4’s mass. This machine has quirks. At wide-open-throttle, it wails. When the motors turn on, the vehicle yaws. The continuously variable transmission, which moves a chain between pulleys, works better than expected. Many CVTs let the engine hang at an annoyingly loud rpm while you’re accelerating. The RAV4’s setup reduces droning, until you stomp on the go pedal. Toy’s center console sports a smartphone tray. Android Auto or Apple’s CarPlay isn’t compatible. The infotainment system hides navigation under a tile-like app icon. That’s an extra step. You can enter destinations by speaking but Toyota nags you to try its tutorial first. A voice coach talks back. It reads aloud previous destinations, say, instead of asking for a touchscreen line number. That’s smart. One vexing affectation is navigation voice volume. You cannot adjust it while driving. Most vehicles let you set the on-board vocal intensity while it’s talking. Just turn the radio’s volume knob. Not here. Instead, you must worm your way into a menu, while the vehicle is stopped. Since the RAV4’s is acoustically rowdy, this scheme bites. In addition, I noticed several infotainment blackouts. Toyota’s steering wheel switchgear is intuitive. A stubby right stalk sets cruise. An instrument-cluster icon presents radar cruise control distance. This image appears whenever the CUV’s speed slows to maintain a vehicle-to-vehicle gap. Drivers, therefore, understand why pressing + doesn’t up the pace. Highway steering effort is firm, accurate but lacks feedback. Backroad bombing reveals decent body rigidity and good directional stability. It will hustle, although there are pauses before the motors kick. Body roll and tire squeal are noticeable. It’s ultimately secure with front and rear Yokohama Geolander 18-inch tires drifting. 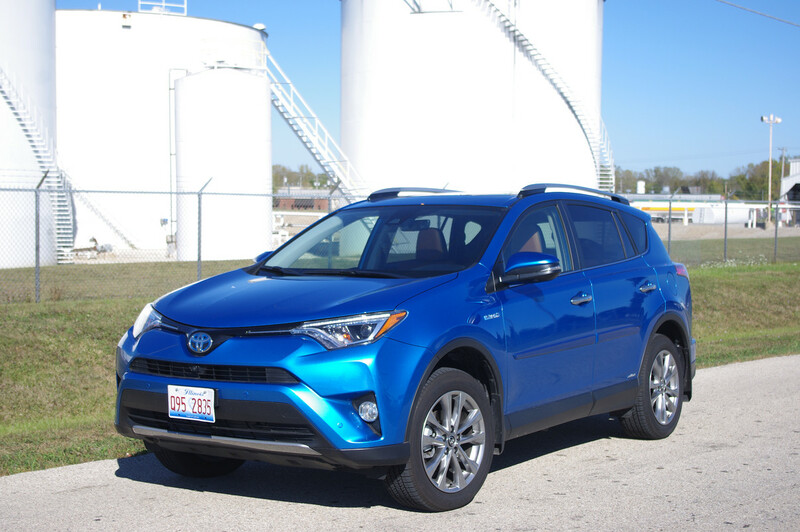 Due to the high center of gravity, the RAV4 isn’t road-rally material. Constantly drumming tires and wind rush make this a loud car. Toyota’s designers need a sun-visor primer. Moving the RAV4’s visors is tricky. They house extender cards that block side-window sunlight. While useful, rays slip around them. If the cards aren’t fully retracted, their edges slam into the rearview mirror, when rotated toward the windshield. That’s frustrating. A tech package includes parking sensors. They’re needed, because the vehicle’s high stance, large side-view mirrors and kicked up fenders blot out nearby low riders. The rearview-camera screen shows parking guidelines. A lane-keeping feature nudges the steering wheel in the appropriate direction based on pavement stripes. On Wisconsin roadways, these painted markings are weathered. Gadget lovers get USB and 12-volt outlets. Faux leather called SofTex trims this wagon’s eight-way power driver seat. The second row reclines Overhead grab handles creak when pulled, as if someone passed gas. Toyota nailed easy ingress. Side doors wrap over the rocker panels. This keeps sills clean and reduces step-in width. I must discuss ergonomics. Operating the throttle pedal is awkward. Its arched shape isn’t a firm platform; the center console’s lower edge reduces pedal access. On bright side, the under-dash space is covered except for some wiring. The tested Limited version features fancy digs, a roomy interior, easy-stow cargo hold, relatively thrifty operation and useful safety gear. It’s a sensible pick. Toyota asks $37,057. Where exactly does one buy a "conventional front-drive station wagon? " Cuz I wanna go there. One could say the Golf SportWagen is conventional. Well , yes. And I'm seriously thinking about either a Sportwagen or Golf.